Sweet Nina's Nom-Noms makes delicious desserts that are handcrafted in small batches using locally sourced ingredients whenever possible. Sweet Nina also happens to be a friend of mine, so when she needed someone to help her with a website for her new business, I was happy to lend a hand. The goal of this project was to begin building excitement for the Sweet Nina brand. The eventual goal is to purchase a food truck and a Kickstarter campaign is in the plans for the future - but for now, Sweet Nina is building awareness and excitement by distributing free samples at area businesses and events. The site will give customers who enjoy those samples a place to connect with Sweet Nina and, hopefully, help support her when that Kickstarter takes off! For the design of the site, I knew I wanted to go big and use photography for her recipes as the "hero images" of the site - and yes, I did get hungry while working on this project. Besides oversized images of the desserts, we also wanted to go with a fun feel for the website. While Sweet Nina has made many wedding cakes over the years, we didn't want to come across as specializing in high-end cakes only. The feel needed to be more fun and energetic and less high-class wedding. Some of the copy that I helped write for the website also helped to carry that fun, quirky feel and show a bit of Sweet Nina's personality. With the design in place, I built the website and integrated it into the ExpressionEngine content management system. The site is fully responsive with a mobile-first approach to the build. 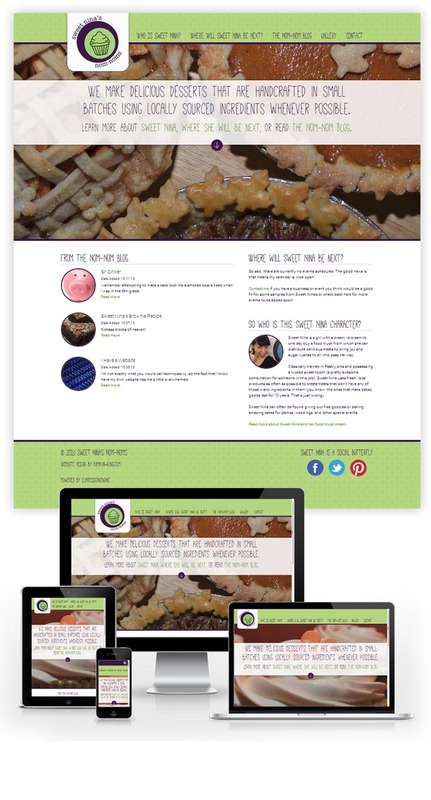 You can see the new site, and learn more about Sweet Nina's dream to buy a food truck and distribute delicious goodies, at www.sweetninasnomnoms.com.